Ahh sweet November, how have you arrived so quickly? It feels like just yesterday that I promised: “This year will be different. This year I will be healthy.” Alas, I maintained some health goals and trashed others. But this month I will not use my normal excuses of “being too tired after work” or “I don’t have time.” No, this month, I will rock my workout schedule! This November, I am challenging myself to ignore the ‘busyness” of the season and have a daily focus on devoting at least 30 minutes to health and fitness! So what do you say, how bout you join me? 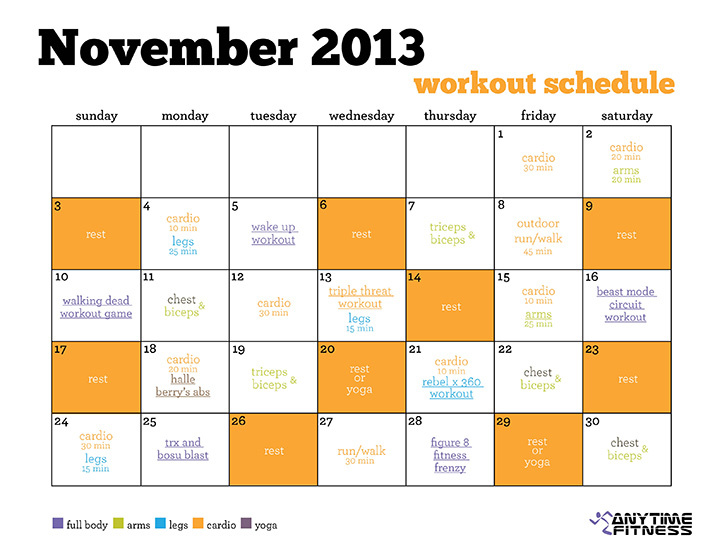 Or download the blank calendar and customize to your own schedule. What are your health goals this November?